With FreePDF You can create PDF files from any application. Just choose File, Print, and the printer FreePDF. With the results you can be seen in a print shop. FreePDF speaks 16 languages. 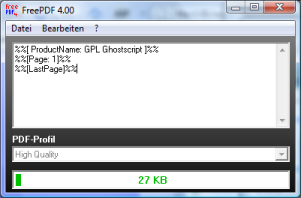 FreePDF can also generate many image formats like Multipage Tiff. FreePDF can merge multiple prints to a single PDF file (MultiDoc function). FreePDF can be customized for your company - features that you do not want to provide you can disable. The previous version of FreePDF is not new - but for old operating systems you still need old software - so you can still download FreePDF 2. The development and deployment of FreePDF cost me money. If you want to support FreePDF, you can do so with a donation. Use the Paypal link or contact me by e-mail to get my German bank account number.